This article focuses on the collective leadership of the civilian authorities of the British Channel Islands during the Nazi Occupation (1940–1945), and draws lessons from their ethical performance. The first part of the article determines that local officials in the Channel Islands disposed of operative margins, but that – in the interest of collaboration – these were not always used to the full. This article then details institutional factors that contributed to commonalities between the two bailiwicks of Jersey and Guernsey, as they faced up to occupation. The second part of this article follows up with the dissimilarities, one of which is that Guernsey travelled further down the road to collaboration than her sister island. Social capital depletion is credited as being responsible for this; and this situation was further compounded by lack of ‘ethical leadership’. 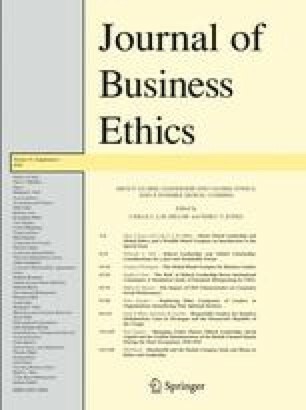 The final part explores the relationship between social capital and leadership ethics, suggesting that virtue serves as a catalyst for social capital stock in crisis situations. The core research outcome is that ethical leadership produces tangible efficiency and moral effects in situations of extreme duress (such as Nazi Occupation) where one could have expected very little or no scope for such a thing. This is an uplifting message that runs counter to scepticism as to the practical value of business ethics. Implications are drawn with regard to the challenge of reconciling MNE activities with the moral complexity posed by globalization. Baron, R.: ‘Social Capital’, in C. Cooper (ed. ), The Blackwell Encyclopedia of Management (Blackwell Publishing, Blackwell Reference Online), http://www.blackwellreference.com. Accessed 28 May 2009. Den Hartog, D.: ‘Leading in a Global Context: Vision in Complexity’, in H. Lane, M. Maznevski, M. Mendenhall and J. Mcnett (eds. ), The Blackwell Handbook of Global Management (Blackwell Publishing, Blackwell Reference Online), http://www.blackwellreference.com. Accessed 19 May 2009. Durlauf, S. and M. Fafchamps: 2004, ‘Social Capital’, Working Paper of the Centre for the Study of African Economies, 214, http://www.bepress.com/csae/paper214. Accessed 23 April 2010.